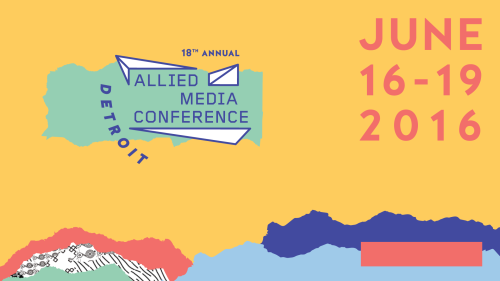 COCo staffers were on hand last month to participate in the 18th Annual Allied Media Conference, held at the Wayne State University campus in Detroit, Michigan. The conference, which bills itself as a “collaborative laboratory of media-based organizing strategies,” ended up being that and so much more: a smorgasbord of workshops, skill-sharing, meetups, panels, and performances spread over a diverse set of tracks and network gatherings. The exchanges and learning that happened over the packed 4-day program left us inspired and reflective on the different ways that community groups and social movements south of the border have integrated media, communications, organizational health and anti-oppression into their strategies. We thought we should share 5 of the great, radical resources we found during our time there. AORTA, a worker-owned cooperative devoted to strengthening movements for social justice and a solidarity economy, shared their awesome resource sheet for Anti-oppressive facilitation— something that will be useful to those of you running meetings, community spaces, or events. Read all about community agreements, tips for defusing tricky situations, and how to recognize red flags. Another resource about Dealing with conflict in a Circle was also distributed in the same workshop. More to come about this topic in a future COCo post! Access Now, an advocacy group fighting for open and secure digital communication, published a guide entitled A first look at Digital Security, containing tips on online security written in layman’s terms. While it is oriented more towards journalists and civil rights defenders, the information around digital privacy and password management are still pertinent for any community organization that use online platforms. The (Re)building technology project, a collaboration between Allied Media Projects, the Detroit Community Technology Project and the Open Technology Institute, also leverages technology for social change, using a wide range of grassroots techniques. Their Re-Building Technology zine is all about digital justice principles, facilitation for community involvement and community-controlled communications. They also have a number of project planning and facilitation tools and guides on their website available for download. We were even impressed by the Presenter Guidelines, created by the conference itself, available as a mini-zine. The zine listed 9 handy tips for presenting a great session, including points on honing facilitation skills and committing to accessibility. It is easily applicable to anyone learning how to give trainings, workshops, or doing popular education. Grab it at the AMC website. The Sons and Brothers project is a US-based collaborative project dedicated to making health and opportunity happen for young people of colour. Representatives from the project distributed (free!) stickers featuring portraits of engaged, successful role models from racialized communities, drawn by independent POC artists such as La Chucha, Melanie Cervantes, and Jessica Singh. They’re beautiful daily reminders of the histories of struggle we have inherited. We hope you enjoyed our post. If you have more resources to share (from the AMC or otherwise), feel free to share them with us! We will see you at the World Social Forum in August!